Organization is the biggest concern for people that want to start a new management project. There are so many pieces to consider: labor, budget, work hours, time off, and the list just keeps adding up. Luckily, this portfolio template helps you keep everything nice and tidy, as you focus on the key points of management for your unique project. When you begin by opening the document file, you will be directed to the first tab, which gives you a visual summary of your management progress. The template is designed to track multiple projects over the week, allowing you to organize each project by name and conveniently list if the project has been completed. 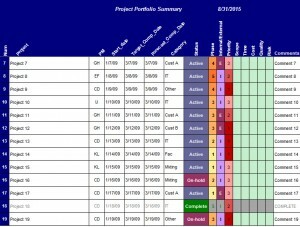 The color coordinated chart allows you to edit the legend to a format that makes sense for your project management style. The “Stats” tab gives you a visual overview and analysis of your project. This feature makes management much easier, as it helps you identify target areas that need more work. The six different pie charts mark your project by: category, status, priority, management, phase, and the internal or external components of the project as a whole. The last tab, titled “Entries” allows you to keep track of your project management leaders as they complete their tasks. This feature is useful to monitor where your employee’s time is being spent, and then to help them adjust accordingly. By monitoring the progress, time, and labor, using this simple portfolio, you can significantly reduce the time spent on project management. Data analysis is key to your efficiency, but you don’t need to waste time plotting every last detail, let this free management document effortlessly steer you on track for your project.